AECB News : Soapbox – can you contribute an article? Use our Soapbox platform to get your point across! AECB soapbox is a platform which members and guest contributors can use to put forward an idea, view, opinion, or a distinctive practice or product that they are itching to share with fellow AECB members. 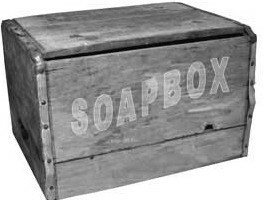 Soapboxes are published generally one per month, and will be flagged up in the monthly Network newsletter, and published on the AECB website, in the AECB news area and social media. A soapbox item will be quite short – around 700 words, and will be clearly identified as opinion. The opinion can be passionately held, but should be backed up with convincing argument. However we do not expect the authors to provide detailed references, or expect them to go into the counter-arguments: they are simply stating a case. Comment and counter-opinion will be invited via a direct link to the AECB’s member forum here. Please note we will not be able to publish any items which AECB considers to be purely advertising of products or services. Please email your idea in the first instance here. This entry was posted on Wednesday, November 16th, 2016 at 5:55 am	and is filed under Soapbox. You can follow any responses to this entry through the RSS 2.0 feed. Both comments and pings are currently closed.